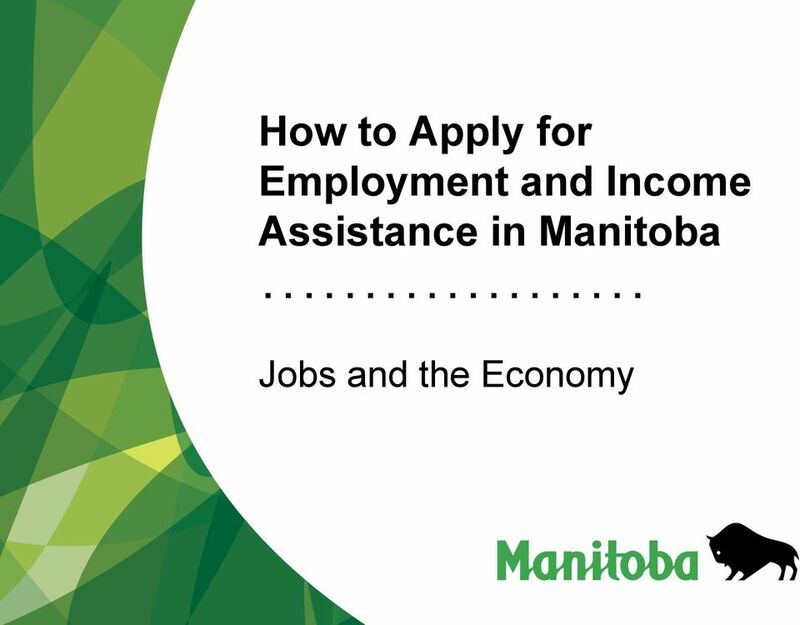 Download "How to Apply for Employment and Income Assistance in Manitoba"
2 WHAT IS EMPLOYMENT AND INCOME ASSISTANCE (EIA)? 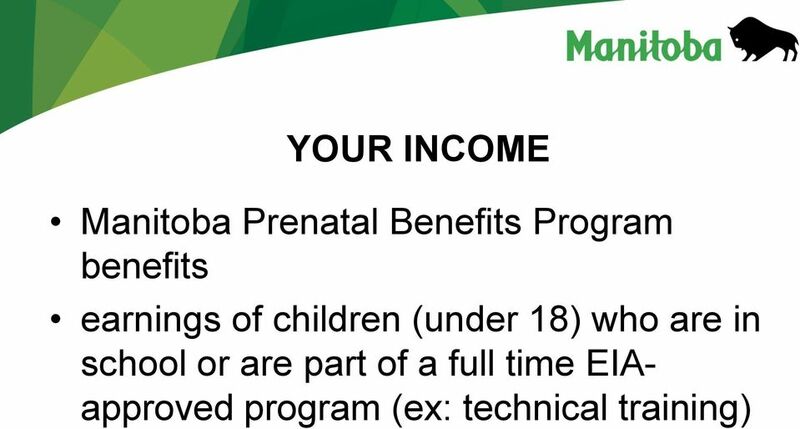 The Employment and Income Assistance Program (EIA) provides financial help to Manitobans who have no other way to support themselves or their families. 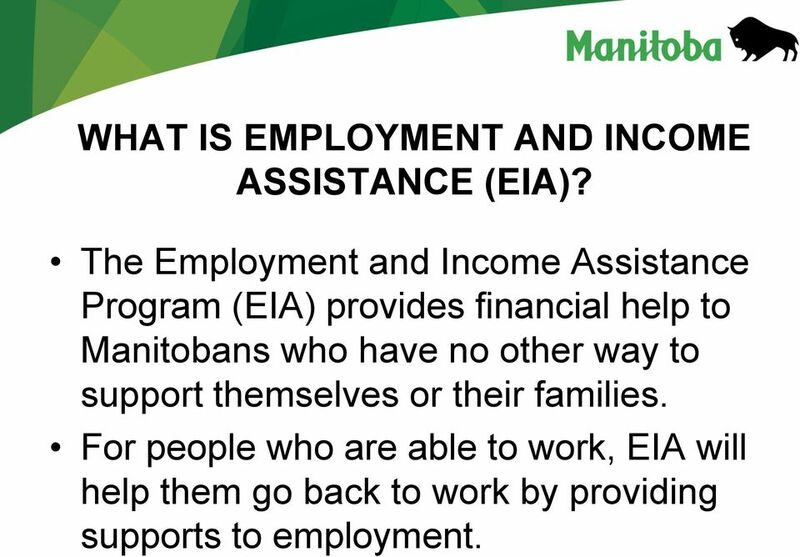 For people who are able to work, EIA will help them go back to work by providing supports to employment. 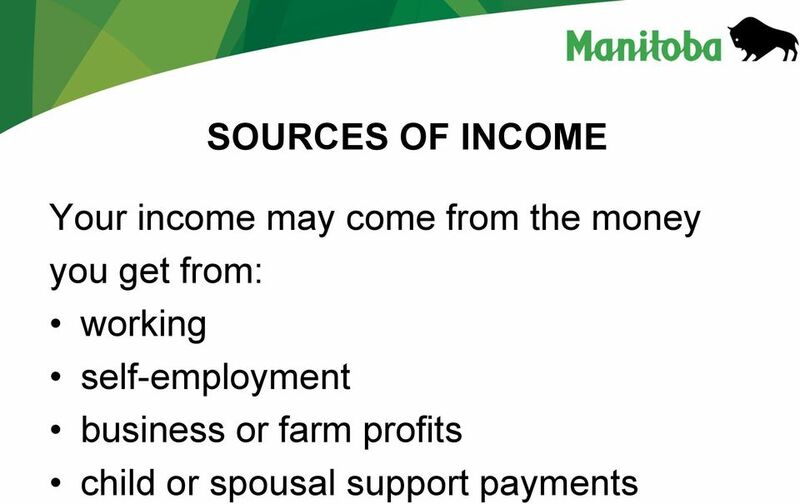 3 WHAT IS EMPLOYMENT AND INCOME ASSISTANCE (EIA)? If you can pay for your basic living costs, but can t pay for your health costs (ex. medicine, medical supplies) you may be eligible for benefits just to cover your health costs. 4 WHO CAN APPLY FOR EIA? 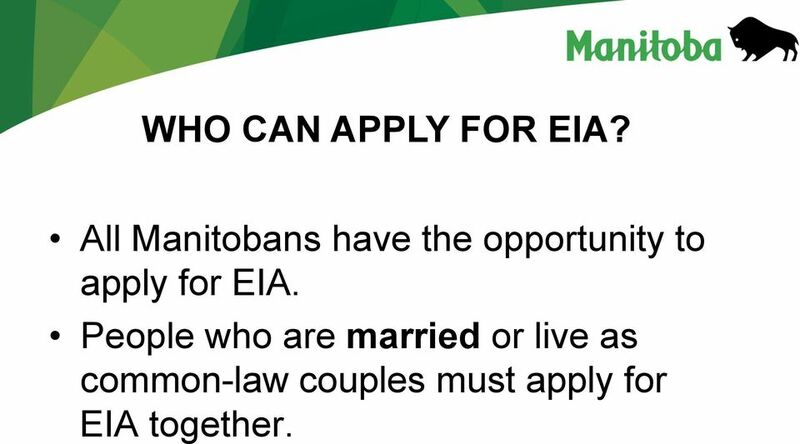 All Manitobans have the opportunity to apply for EIA. 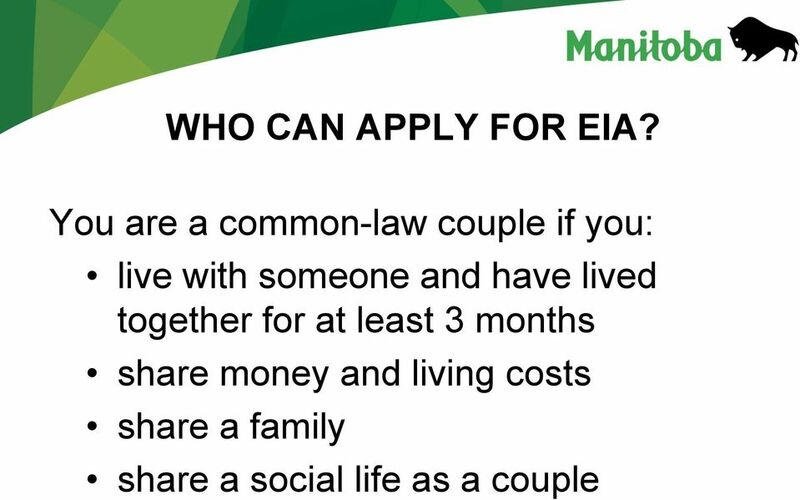 People who are married or live as common-law couples must apply for EIA together. 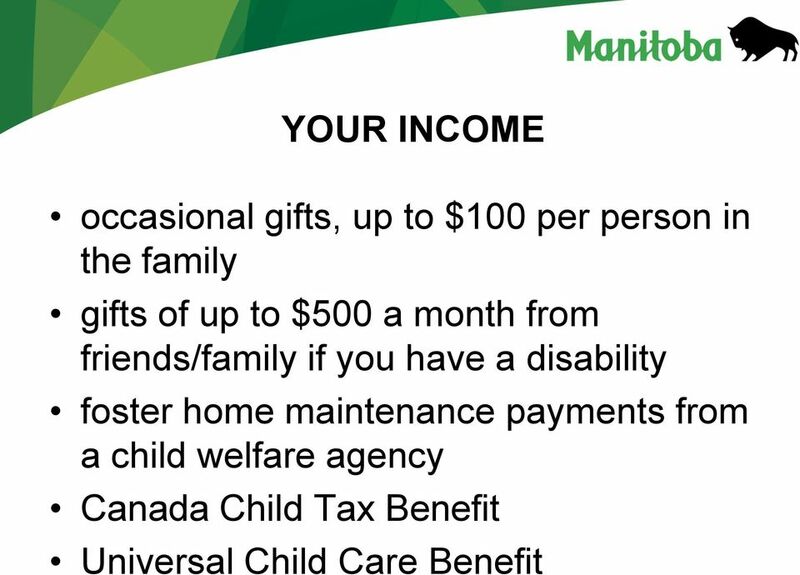 6 FINANCIAL NEED You may be eligible for assistance if the total cost of your (or your family s) monthly basic needs is more that your total financial resources. 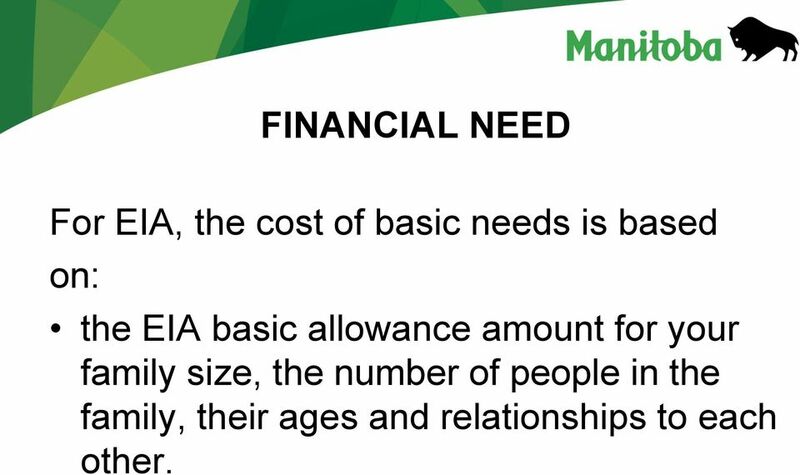 7 FINANCIAL NEED For EIA, the cost of basic needs is based on: the EIA basic allowance amount for your family size, the number of people in the family, their ages and relationships to each other. 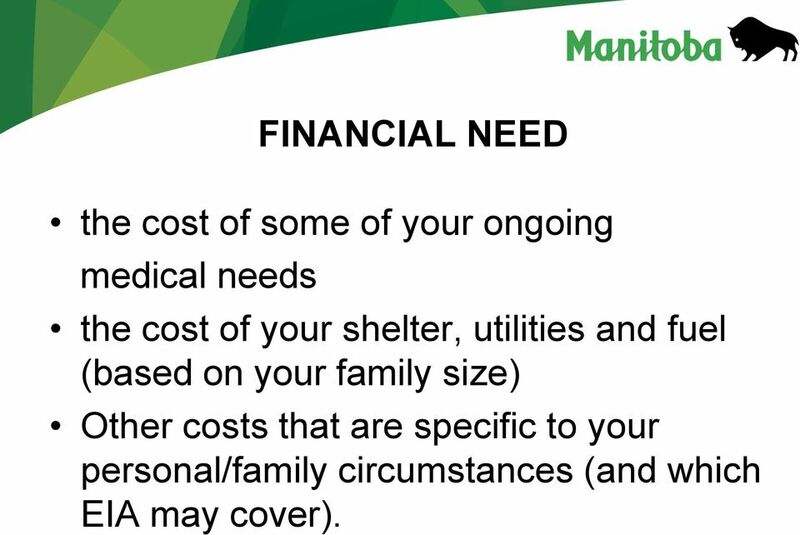 8 FINANCIAL NEED the cost of some of your ongoing medical needs the cost of your shelter, utilities and fuel (based on your family size) Other costs that are specific to your personal/family circumstances (and which EIA may cover). 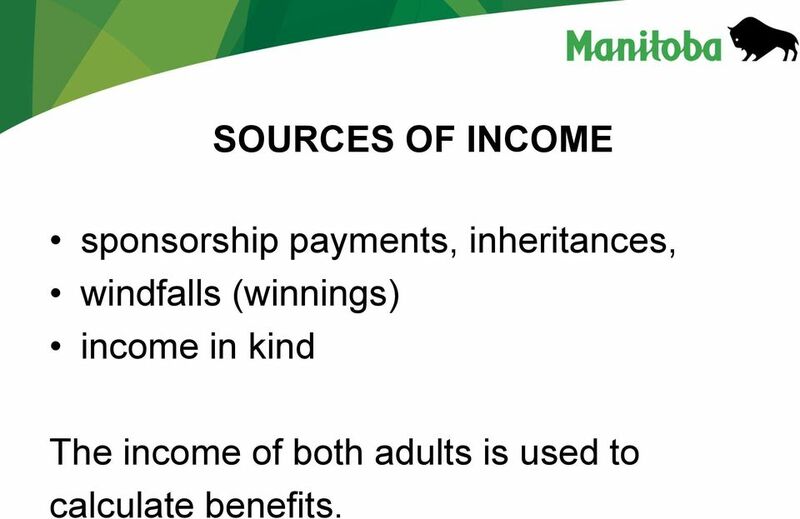 11 SOURCES OF INCOME sponsorship payments, inheritances, windfalls (winnings) income in kind The income of both adults is used to calculate benefits. 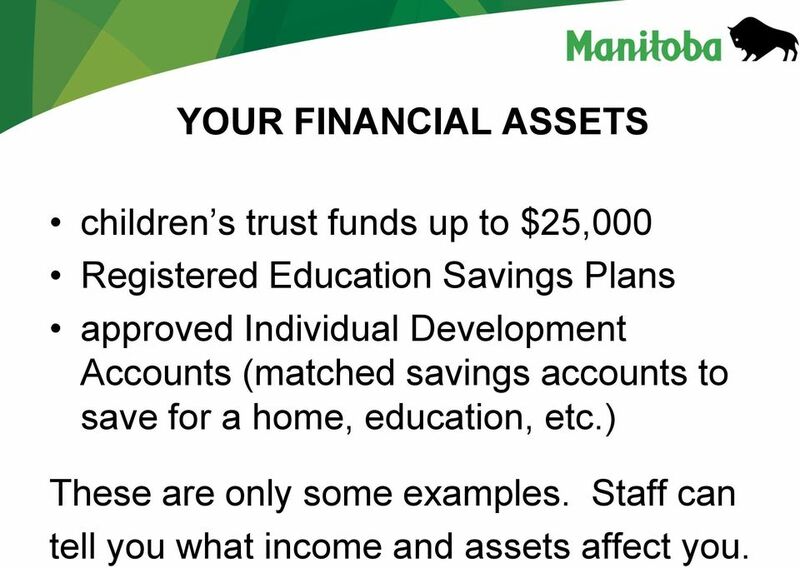 17 YOUR FINANCIAL ASSETS children s trust funds up to $25,000 Registered Education Savings Plans approved Individual Development Accounts (matched savings accounts to save for a home, education, etc.) These are only some examples. 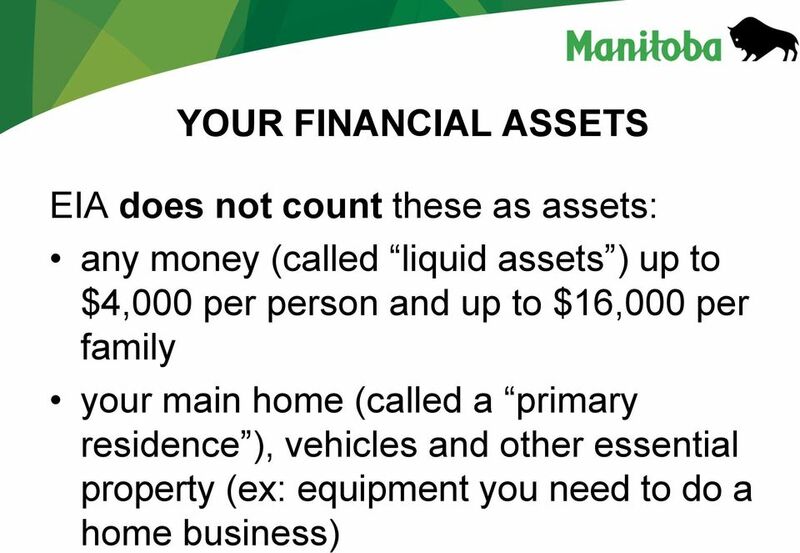 Staff can tell you what income and assets affect you. 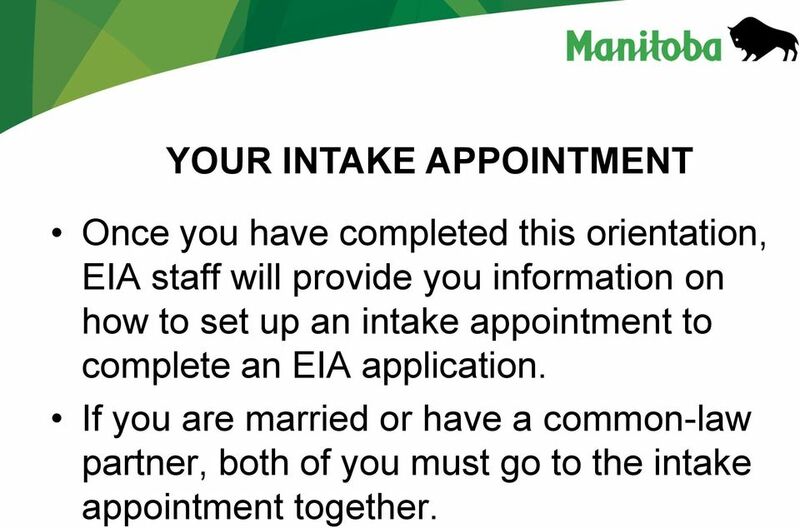 18 YOUR INTAKE APPOINTMENT Once you have completed this orientation, EIA staff will provide you information on how to set up an intake appointment to complete an EIA application. If you are married or have a common-law partner, both of you must go to the intake appointment together. 21 WHAT DO I BRING TO MY INTAKE APPOINTMENT? Bring all the information and papers that are on the checklist that apply to you. 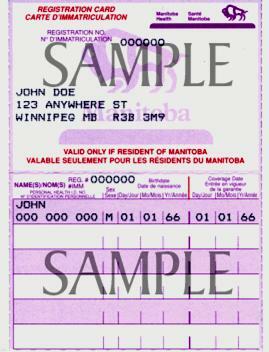 Personal information - You must bring two pieces of identification (ID) with you. Your spouse or common-law partner must also bring two pieces of ID. If you have children, you must bring one piece of ID for each child. 28 BANKING INFORMATION You must bring copies of your bank statements for every bank account you have in your name. This applies to both partners if you are married or live common-law. You must bring statements for the past two months (60 days). 29 DIRECT DEPOSIT The EIA program now uses direct deposit only to pay out EIA benefits. Direct deposit means money will be put directly into your bank account. Direct deposit is a safer and faster way to pay your EIA benefits. 30 DIRECT DEPOSIT If you are eligible to apply for EIA benefits, you will have to fill out a form to have payments paid directly into your bank account. 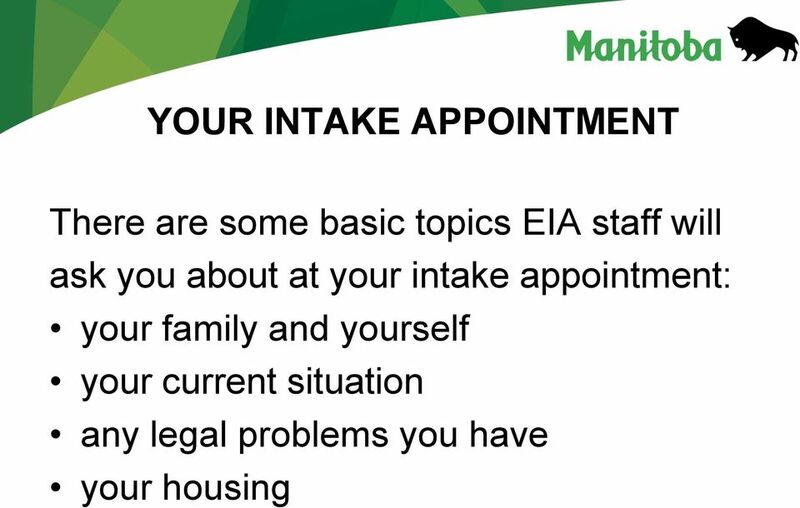 If you do not have a bank account, talk to EIA staff at your appointment. 36 HOW DOES EIA DECIDE IF I CAN GET BENEFITS All the information and paperwork you put together is used to help EIA decide if you can receive money for basic needs. EIA uses all of this information to do a test of need. 37 TEST OF NEED Your test of need adds up all of your income and assets. It also adds up all your costs and expenses for basic needs, the amounts for which are set by The Employment and Income Assistance Act and Regulation. 38 TEST OF NEED Your test of need will tell EIA if your total basic costs are more than your total income and assets. The amount of EIA you will receive is the difference between your needs that EIA will fund and your resources. 39 OUTSTANDING WARRANTS EIA encourages you to deal with any outstanding warrants as soon as possible. If you are a single person and have an outstanding warrant for a serious offence, you may not be eligible for benefits. If you have multiple people in your household, your benefits may be reduced. 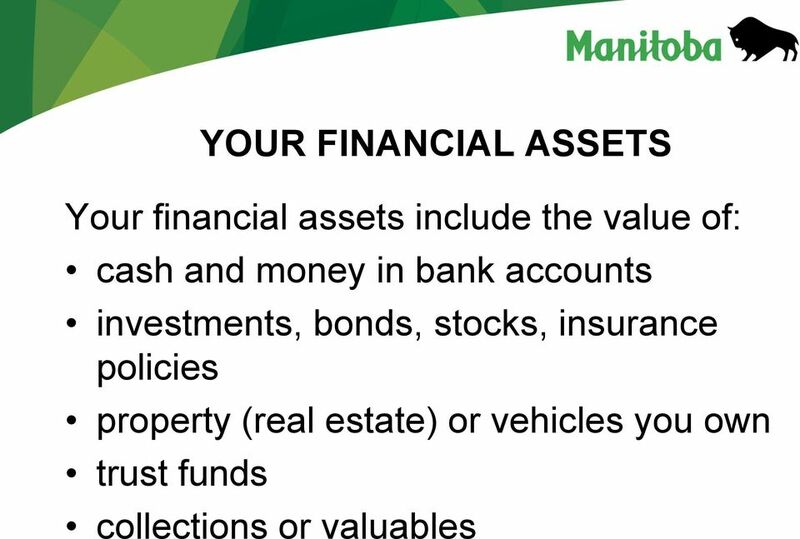 Staff can provide you with a fact sheet with more information on outstanding warrants. 40 TO RECEIVE EIA To receive EIA you must: Complete the Application, Employment History and Personal Action Plan forms. Provide identification and/or documents to show the information on the forms is accurate. 41 WHAT YOU CAN EXPECT FROM EIA You can expect courteous and respectful service from EIA staff. In return, we appreciate your cooperation in treating our employees with courtesy and respect. 42 YOUR RESPONSIBILITIES UNDER EIA Once you start receiving EIA benefits you must: Complete an Annual Review once a year to show you are still eligible for EIA. Meet the terms of any work expectations that apply to you. 43 YOUR RESPONSIBILITIES UNDER EIA Do interviews with staff, from time to time, to show you are still eligible for EIA and to discuss your action plan. Make reasonable efforts to get and use all other financial resources available to you and your family (ex: federal benefits, child or spousal support, pensions, insurance, WCB). 44 YOUR RESPONSIBILITIES UNDER EIA Immediately report to staff all changes in your family, living arrangements, address, income or assets. Repay all overpayments you may have, even after you leave EIA. 45 YOUR RESPONSIBILITIES UNDER EIA An overpayment occurs when you receive more than what you should have received. If you are responsible for an overpayment, EIA may recover it from you through reduced EIA payments, Canada Revenue Agency s Refund Set-Off Program or placing a lien against property you own. 46 YOUR RESPONSIBILITIES UNDER EIA Repay what EIA pays for the principal of your mortgage, back taxes on property or major house repairs. A lien can be put on your property that allows EIA to collect the repayment when you sell your property or if you refinance your house. 48 HOW EIA WILL HELP YOU PREPARE FOR AND GET A JOB While most people who receive income assistance are expected to prepare for and get a job, programs and services are available if you are not ready to look for work. For some, this may mean supports to get and keep a job, for others it could involve training. 49 HOW EIA WILL HELP YOU PREPARE FOR AND GET A JOB A training and employment assessment will be completed to help you plan for financial independence. Staff will ask about your employment goals, work and educational history, skills and interests and personal factors such as your family situation, housing, childcare needs, medical issues etc. 50 HOW EIA WILL HELP YOU PREPARE FOR AND GET A JOB Planning begins after your areas of strength and need have been identified. Using the information, staff will be able to discuss your current level of job readiness and identify any barriers that may need to be addressed. 51 HOW EIA WILL HELP YOU PREPARE FOR AND GET A JOB You and staff will develop a mutually agreed upon Action Plan that matches your needs and abilities. The Action Plan will list the things you and the department will need to do to: help you prepare for work, or connect you to programs or services that are available if you are not ready to look for a job or take training. 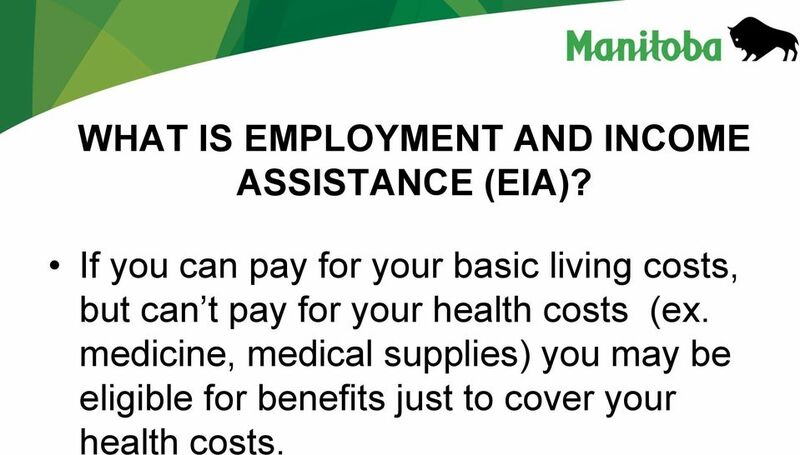 52 HOW EIA WILL HELP YOU PREPARE FOR AND GET A JOB EIA can connect you to services that will help you prepare for work or training such as: Employment Manitoba for resume preparation, job readiness support, career exploration, education and training support. 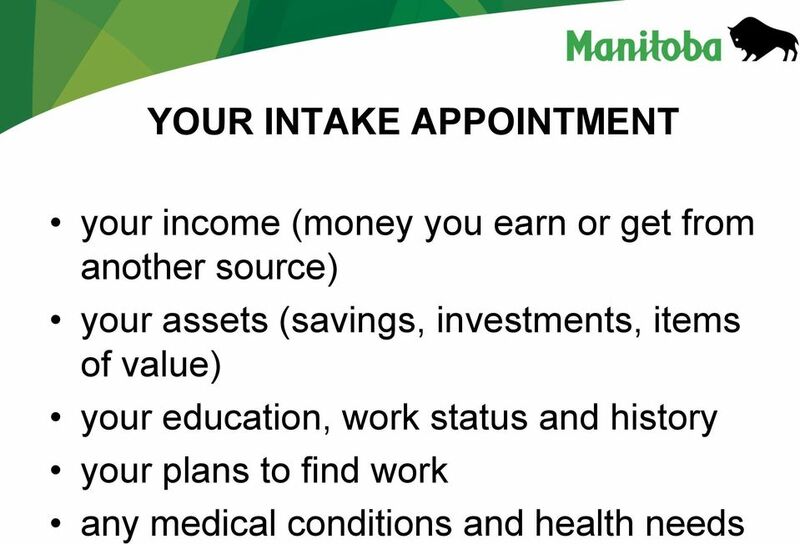 Essential Skills Manitoba to help you identify your current skills, learn about how they match your chosen career goal and identify a plan to address any gaps. 53 HOW EIA WILL HELP YOU PREPARE FOR AND GET A JOB EIA can also refer you to community agencies that will help you address personal or family issues when significant barriers have been identified that prevent you from job searching or securing employment. 56 SOCIAL SERVICES APPEAL BOARD If you think the decision was unfair, you can appeal for these reasons. EIA staff would not allow you to apply or re-apply for EIA. EIA staff took too long to decide if you could get benefits. 57 SOCIAL SERVICES APPEAL BOARD You were told you could not get benefits, even though you think you are eligible. Your benefits were cancelled, suspended, changed or withheld. The benefits you were given are not enough to cover your basic needs. 58 SOCIAL SERVICES APPEAL BOARD Appeals are made to the Social Services Appeal Board. The Board provides a fair, informal hearing to let you give your reasons for the appeal. Send your request in writing to the Social Services Appeal Board. 59 SOCIAL SERVICES APPEAL BOARD If anything has changed since your application, it is important to tell EIA staff and the appeal board (ex: changes in your family size, home address, income and work). 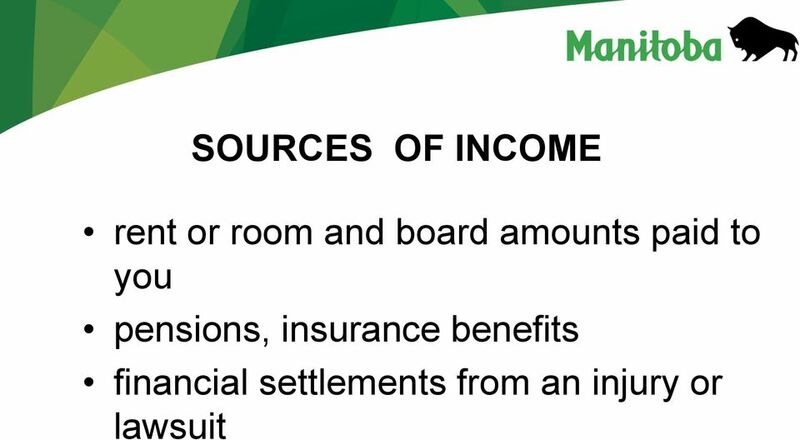 This information could affect the decision about getting benefits. 61 PROTECTING YOUR PRIVACY As a government program, EIA has the legal right to collect, use and share the information you provide. The information you give will only be used to find out if you need EIA and to provide the programs and services for you and your family. 62 PROTECTING YOUR PRIVACY If EIA needs to share information about you and your health, EIA staff follow the rules of The Freedom of Information and Protection of Privacy Act (FIPPA) and The Personal Health Information Act (PHIA). 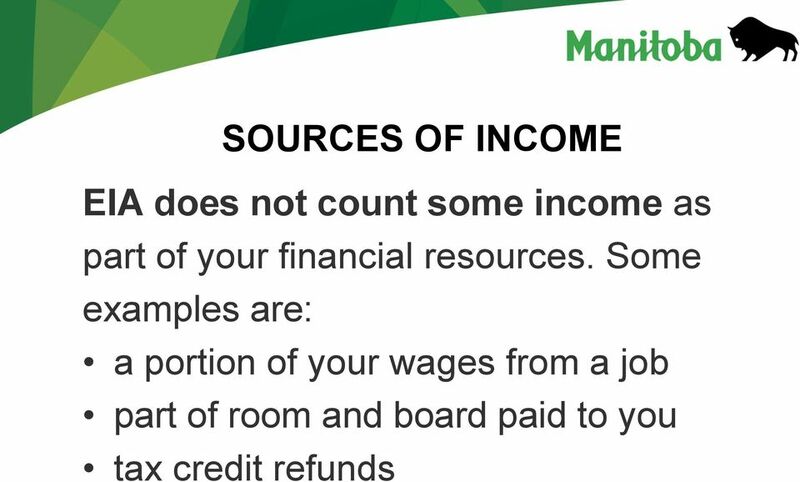 Winnipeg Housing Rehabilitation Corporation Housing Application Form In all cases Payment History If you work provide a certified copy of last year s income tax (available from Revenue Canada at 1-800-959-8281). Please note: For any return that is prepared while you wait, payment is expected at the time of completion. Application for Request for a Tax Plan and Your Responsibilities Attached you will find an application for requesting a Tax Plan from the New Durham Board of Selectmen. Please fully complete the application. CRA requires that all offshore assets in excess of $100,000 CDN be declared by the taxpayer. Please inform us if this situation applies to you. FREE CARE APPLICATION ATTACHMENT PLEASE REMEMBER THIS IS NOT AN INSURANCE PLAN IT IS A CHARITABLE CARE PROGRAM AND THERE IS NO ESTABLISHED FUND. THERE IS NO MONEY EXCHANGED FOR SERVICES BY ANY CMC PHYSICIAN/PRACTICE. Thanks for making an appointment to see us! A form that will help you identify, locate, and organize the important documents your will need as a primary caregiver. Foreclosure Intervention Client Counseling Session Packet IMPORTANT CLIENT NOTICE All Clients must complete all pages in this packet and provide all requested documents before an appointment can be scheduled. STATE OF NEW MEXICO COUNTY OF BERNALILLO SECOND JUDICIAL DISTRICT, Petitioner, v. No., Respondent. MARITAL SETTLEMENT AGREEMENT (Husband=s name) and (Wife=s name) are married. We agree to this entire agreement. Thank you for choosing our firm to prepare your income tax returns for tax year 2014. This letter confirms the services we will provide. Deborah Wright Keystone Management Services, LLC P.O. Box 965564 Marietta, GA 30066 January 19, 2015 Dear Taxpayer, Thank you for choosing our firm to prepare your income tax returns for tax year 2014.